Vocabulary is a vital component, but unfortunately 99% of the job depends on the student. Teachers can't do so much to help students, just provide them with word lists and trust they will memorize all the words. If you want to minimize this problem, and invest your time in Grammar, Listening and Pronunciation, we can help you with our vocabulary platform for schools. Do you want to try it for free during 4 months? If answer is 'yes' contact us. Home page shows a school main menu instead of general info. Main menu has link to your school website. A Main Administrator can create Teachers. Teachers can build groups (classrooms). 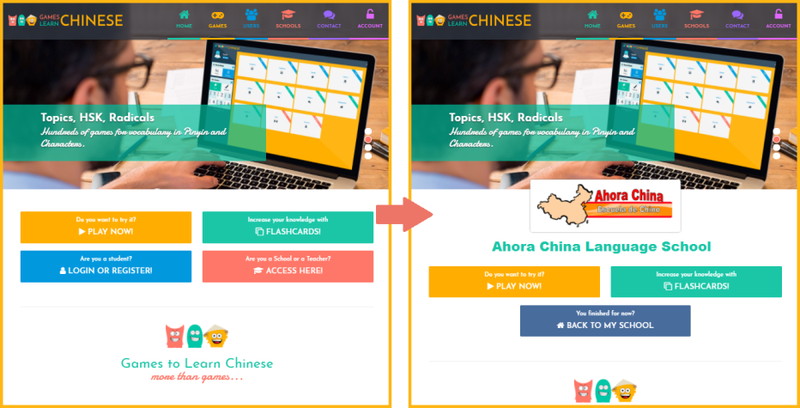 Teachers can assign homework to the students (e.g "You must complete game 'HSK2.1' for next tuesday with silver medal"). Students can see their position in rankings (by classroom, school, state, country, worlwide,...). Students will enjoy a premium account (full access to all games, no ADs, statistics, trophies, extra content,...). Administrator can add-remove students up to the license limit according with the school needs. If you have a 3-month intensive class with 100 students at a time, 'Basic License' can accommodate the 400 students who will study at your school over the entire year. Once a student leave your school, he can still use our site if he get a premium account (all the progress, scores, belts,... he made, will be available for him). Invest the time of your teachers more effectively, and do not waste more time teaching vocabulary. Delegate this job to us, we want to be your partner for vocabulary. Do not think how much does it cost, think how much do you save. Motivate your students. They will work to get more trophies, to increase their positions in rankings, to change belts,... always in a funny way. Fidelize your students. They will enjoy a premium account without any cost. Improve your brand image and catch new students by offering a customized eLearning platform. Overtake your competitors by using new technologies. Take a solid position against the 100% online courses that could push traditional schools out of business. Once you know all the benefits of this platform for schools, let us show you the most important and attractive feature of this tool, ... the very low price. Pay attention to the price per student monthly and you will have a good reason to choose us as your partner for vocabulary. Do you need more students? Contact us!